2017 is my tenth year of exploring and writing about Los Angeles communities. In 2007 I explored Granada Hills, Montebello, and Alhambra, and titled my series California Fool’s Gold in homage to Huell Howser‘s California’s Gold (1991-2012). In 2014 I spun of a related series, Urban Rambles, in which I undertake short, small, loosely structured walks of various corners of Southern California. As part of my tenth anniversary of blogging about Los Angeles, I decided to reach out to friends and people I admire to see where they would choose to explore. The first person that I contacted was a past collaborator, Maya Santos, the talented filmmaker behind Form follows Function (FfF). She suggested exploring a neighborhood which no longer exists, Bronzeville. Bronzeville was a black neighborhood which rose and fell within the territory of Little Tokyo during the years of the 1940s in which Japanese-Americans were interned in concentration camps. Bronzeville is one of those Los Angeles neighborhoods that mostly exists in newspaper archives and fading memories, having gone the way of Brooklyn Heights, Crown Hill, Edendale, French Town, Furusato, Greek Town, Little Italy, Sonoratown, Surfridge, York Valley, and the Native American villages before them. The idea of exploring such an almost entirely vanished neighborhood intrigued me. Maya enlisted the help of Michael Okamura — president of the Little Tokyo Historical Society — and he agreed to lead a free, public exploration of neighborhood on which we were joined by about two dozen other folks, who in some cases contributed their own information and memories. The timing of our exploration corresponds with that of the annual Los Angeles Asian Pacific Film Festival, presented every year since 1983 by Visual Communications (VC). The dates of the 33rd edition are 27 April – 4 May. 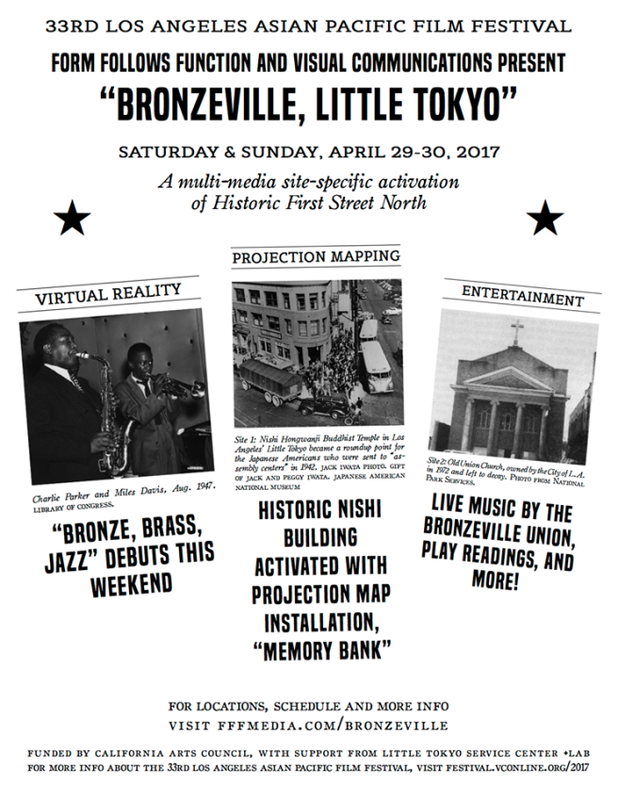 As part of that event, Form follows Function and Visual Communications are co-presenting a multimedia, site-specific “activation” of First Street in Little Tokyo, inspired by the under-documented and overlooked community of Bronzeville and titled Bronzeville, Little Tokyo. The original project is a follow-up to FfF and VC’s 2016 collaboration, Interactive Little Tokyo! The project is funded by California Arts Council and supported by Little Tokyo Service Center‘s +LAB. That two day event will take place 29 and 30 April 2017. Read the rest of this post on Eric Brightwell’s blog.